Three years ago I developed a creative arts Lenten retreat based on the Revised Common Lectionary passage. And guess what? The Lectionary has cycled back around to those same passages this year! 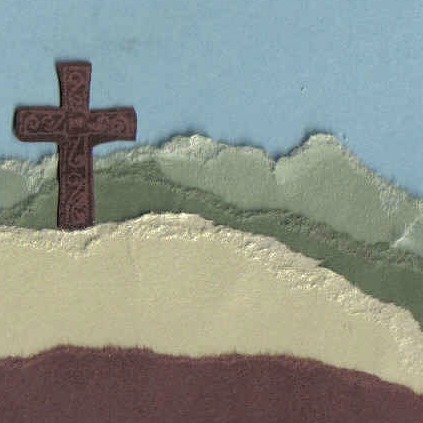 So I will be sharing from that retreat material throughout Lent: scripture reflections, visual art prayer practices and creative writing prayer practices. The title of the retreat is “Holy Spaces.” I pray that you experience Lent as a holy space in your life this year. A few years ago I was offering the imposition of ashes at our church service. Sketching the black crosses onto the offered foreheads as those who came forward pulled their hair out of the way and bent towards me. “Remember you are dust and to dust you shall return.” I spoke the words to each person. Then I looked up and saw my 12-year-old daughter. Suddenly the ashes were heavy and hot on my fingers. The words stung and stuck in my mouth. I did not want to say them. I did not want them to be true. Not for her. But I did say them because they are true. The words are true and good and right. But it takes humility to trust God’s truth and God’s love over our own. Trusting God takes a humility, a relinquishment of control, that can prove very hard for a mother, for a pastor, for a lover, for a deep friend. Humility is difficult, and it is necessary if we hope to inhabit a holy space. If our own ego–our own pride, our own sense of self, our need to be the one in control–is too big, there is not room for God. If our focus is on ourselves, we will miss seeing God’s presence around us and within others. The readings from Joel and Psalms indicate the human need for confession and repentance. They happen in that order. First we must admit to the sin in our lives. Name it within ourselves and before God. Then we are able to receive God’s grace; to turn from our sin toward God. For Joel, this call for confession and repentance is communal. The faith community as a whole has turned from God. The people are called to come together; to confess their sins together; to fast and weep and mourn; to turn together toward God. The psalmist’s plea is more personal: “Have mercy on me O God.” As we enter into Lent and confess our sins, it is important that we consider both individual and corporate sin. It is important that we humble ourselves not just as individuals, but also as families and churches and communities. Jesus’ teaching in Matthew 6 urges humility in our religious practices. We should not give money or offer prayers as a way to show other people how spiritual we are. This is a good lesson to hear at the beginning of Lent, because this is a season when there is an emphasis placed on spiritual practices. Many people give things up for Lent or they take on new disciplines. And there are appropriate times and places to share about our spiritual commitments as a way of encouraging others and receiving encouragement for ourselves. There is also a danger of turning Lenten practices into a sort of spiritual Olympics: “The bronze goes to Fred for giving up red meat. The silver goes to Susan for giving up Facebook. And the gold medal for Lenten deprivation goes to Mary who gave up caffeine–including coffee and chocolate!” The reward for our spiritual practices comes from God, not from other people. We give things up or take things on in order to be more aware of God’s presence in our lives–not so that other people will think that God is more present with us than with them. One of the reasons I like the term “spiritual practice” so much is the sense of privacy that it invokes. You do not practice in front of an audience. You practice by yourself, or with a gifted teacher, or with a group of other people who are trying to master the same skill. We all need a lot of spiritual practice. There is very seldom a call for spiritual performance. So if giving up caffeine increases your awareness of God’s presence in your life, by all means deprive yourself of chocolate for forty days. Just don’t expect a medal. Instead, expect an encounter with God; the God who knows you deeply; the God who loves you deeply; the God who dwells within you and around you, whether you recognize this space you inhabit as holy or not.